Only 16 teams remain in the 2016 NCAA tournament, and Luke Winn ranks them from mostly likely to win the national title to least. The Buddy Hield-off-the-dribble research that draftexpress.com’s Mike Schmitz Tweeted this week inspired me to take a deeper look at the Bahamanian Bomber’s shooting. Synergy’s halfcourt data from the entire season shows Hield with a nearly even split of off-dribble and off-catch jumpers, and although he’s much improved off the dribble from previous seasons (0.94 PPP as a senior), he’s far more efficient off the catch (1.53 PPP). While we’re on the topic of ballscreens and defensive turnover percentage ... Indiana is 6–5 when its defensive TO% is less than 17%, and 21–2 when it’s 17% or higher. In the second round of the NCAAs, the Hoosiers forced takeaways on 22.5% of Kentucky’s possessions and—surprise!—IU pulled off the upset. The Hoosiers’ work against the Wildcats’ NBA-bound backcourt was particularly impressive. Point guard Tyler Ulis committed four turnovers, all in halfcourt pick-and-roll situations, and all because Indiana had a help defender in a smart position to disrupt the play. Three times that help defender was Troy Williams, whom IU smartly dropped off of non-shooter Isaiah Briscoe and into areas where he could force Ulis to travel or make an ill-advised pass. 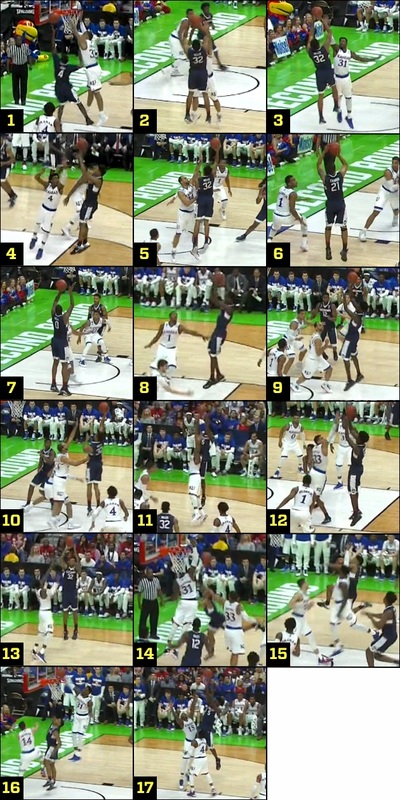 Shooting guard Jamal Murray committed three turnovers, all of them offensive fouls on which he extended his off arm while driving; Robert Johnson drew one of the charges, while Williams drew two. For a Hoosiers defense that ranked 330th last season in defensive TO%, and is 104th this season, these are promising developments. Morris said there was science behind the switch: “My legs were feeling heavy,” he explained, and after 60 minutes of game time in the Denver altitude, he needed a change. “The [Georges] are at least a few ounces lighter.” For a guy who’s played 93.9% of the possible minutes this season, every ounce matters. I’m curious to see if Duke employs its Brandon Ingram-topped 1-3-1 zone to disrupt Oregon’s offense in Anaheim. The Blue Devils switched to it in the final 10 minutes of their second-round win over Yale, and although it messed with the Bulldogs’ offensive flow, it didn’t actually stop them from scoring. I counted 11 halfcourt possessions of 1-3-1, in which Duke yielded 14 points, or 1.27 PPP. The Blue Devils bothered shots, but they gave up four offensive rebounds and committed four fouls in that stretch. Ultimately their (estimated) 51 possessions of halfcourt man and transition D were more efficient, yielding 0.94 PPP. If the foul-drawing Melo Trimble that we came to know during his freshman season is re-emerging in March 2016, maybe Kansas is in for more of a scare than the 6.5-point Vegas spreads suggest. Trimble has generated 23 free-throw attempts in 65 minutes played in this NCAA tournament, and his tourney ratio of FTAs/FGAs is 0.958—well above the .461 ratio he had over the course of this season, when he appeared to be held back by undisclosed ailments. Trimble’s ‘14–15 ratio was .710, the second-highest for any major-conference freshman. • ​MORE: What did we learn in the tourney's opening weekend? Koenig said we shouldn’t be surprised that he hit that shot; apparently he practices similar versions of it in warmups all the time. He’s also the rare shooter whose guarded catch-and-shoot efficiency, per Synergy, is better than his unguarded efficiency, so this was pretty much his ideal degree of difficulty for a buzzer-beater. The Irish have the fifth-best offense left in the NCAA tournament, but the worst defense by a wide margin. They rank 172nd in adjusted defensive efficiency on kenpom.com, and teams with defenses that porous don’t win national titles. Just one school that ranked outside the top 100 in adjusted D entering the NCAA tournament—2011 VCU, which ranked 145th—has reached the Final Four since these stats began being tracked in 2002. If the peak version of Notre Dame’s offense shows up in Philly, it could make the Final Four, but its D leaves so little room for error against elite competition that it’s difficult to envision the Irish winning six games in a row. The Orange’s Friday matchup with Gonzaga features clashing three-point philosophies. Syracuse takes 43.1% of its shots from deep, the second-highest rate among Sweet 16 teams, and the Zags only allow their opponents to take 33.0% of shots from deep—the fourth-lowest rate among Sweet 16 teams. Syracuse’s offense can get so stagnant when it’s not hitting threes that if Gonzaga’s style wins out, the Zags are headed for the Elite Eight.